Goodreads: Want to impress the hot stranger at the bar who asks for your take on "Infinite Jest"? Dying to shut up the blowhard in front of you who's pontificating on Cormac McCarthy's "recurring road narratives"? Having difficulty keeping Francine Prose and Annie Proulx straight? 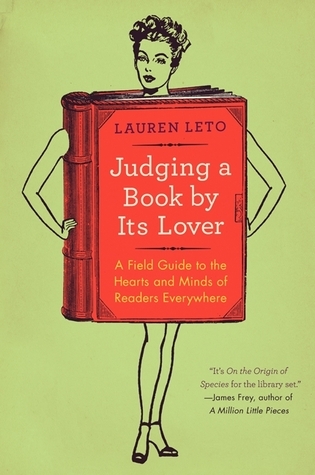 For all those overwhelmed readers who need to get a firm grip on the relentless onslaught of must-read books to stay on top of the inevitable conversations that swirl around them, Lauren Leto's "Judging a Book by Its Lover" is manna from literary heaven! A hilarious send-up of--and inspired homage to--the passionate and peculiar world of book culture, this guide to literary debate leaves no reader or author unscathed, at once adoring and skewering everyone from Jonathan Franzen to Ayn Rand to Dostoyevsky and the people who read them. Kritters Thoughts: A piece of nonfiction work that is interesting for both a non reader and a super reader. As a reader, I usually limit my reading to a few genres and current books, so I enjoyed reading this book as it clued me into books that I didn't read in college or years right after and it actually gave me a list of books that I am going to try to make time to read. As far as the faking it part, I didn't love it and thought it could be presented in a different way. I don't ever fake reading a book, either I have or I haven't and would never want to fake it. But beside that part of the book, I enjoyed reading about the book industry as a whole and the funny things you can learn from people who read certain genres. Although the author may have poked a bit too much at authors and books that I adore, I wasn't too offended. I would definitely recommend this book to readers of all genres. The books she promoted and spoke about where what I maybe would qualify as semi classics - not the usual classics that everyone has heard about, but those that most may have, but if you aren't a reader you may not have heard of a majority.